My life has, at times, felt like assembling a jigsaw puzzle on a roller coaster — frantic, confusing, and frequently bizarre. Call me a survivor, human pretzel, sometime circus juggler, and mom. I have felt like a sidewalk performer sometimes — with one too many balls in the air, dealing with yet another perplexing, and often humiliating situation; trying to do it gracefully, making it all up as I go, trying not to break a sweat, knowing that I will be judged on my performance. I had an epiphany about my self-judgement. The criticisms I heard as a child had been woven their way into my thinking, making me my own worst critic. And it seems that the traits that are closest to my core are what I was most ashamed of; like a psychological version of graft-versus-host disease. I have an intensity, enthusiasm, and sensuality that I have never been able to stifle. 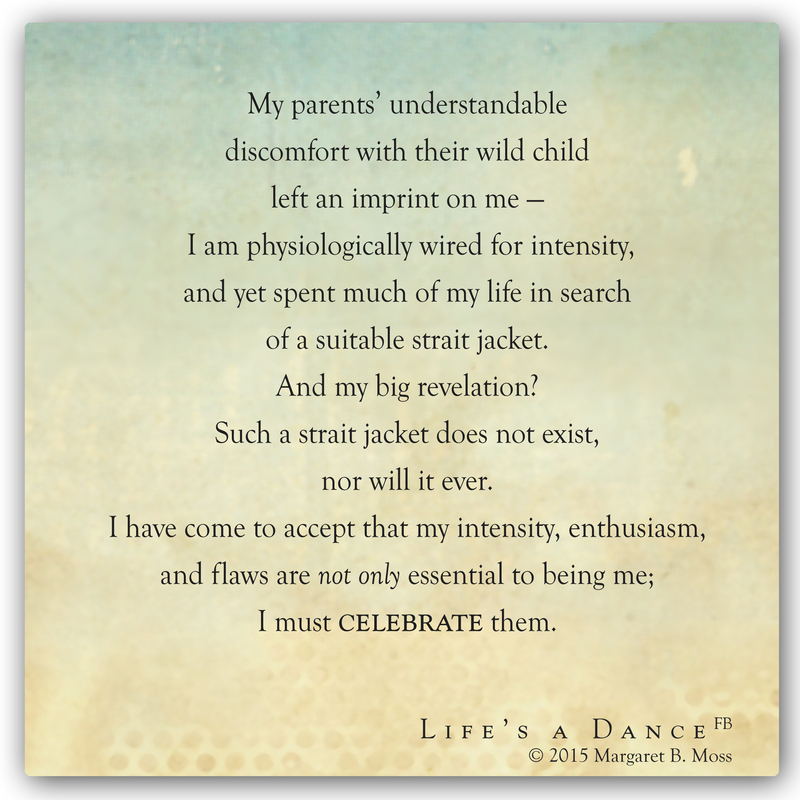 My parents’ discomfort with their wild child left an imprint on me — I am physiologically wired for intensity, and yet spent much of my life in search of a suitable strait jacket. And my big revelation? Such a strait jacket does not exist, nor will it ever. 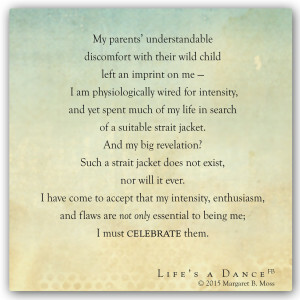 I have come to accept that my idiosyncrasies and imperfections are essential to being me. And it is the sweet oddities of others that endear them to me. All of which lead me to a basic truth: Our flaws are like a Cosmic Good Housekeeping Seal of our humanity. We can choose to celebrate, rather than stifle, them. I am a grown woman who never learned to whistle or appreciate legumes, with an asymmetrical face. I make embarrassing noises when I laugh. I sometimes confuse my priorities, spending 20 minutes rescuing a lightning bug, even if it makes me late. And because I’m grounded with my basic stuff in order — my integrity, tolerance, generosity, and kindness — I don’t suffer with my own flaws like I used to. I have arrived at a point where I can say, “enough with the self-judgment.” Or maybe it would be more accurate to say that I’m on the train headed for that destination and it’s pulled out of the station. I’m travelling lighter. My mother once said, “The best suitcase will break if you stuff it too full.” I have learned — after breaking open and spilling out my contents — how to carry my baggage with more grace. I have learned what pieces will always travel with me, and what baggage I must give up to move forward. As Rumi illuminated for me: there’s no teacher like pain, no clarity like that which you see through suffering, and no light like that which comes to us through a wound. I recognized that pain and fear had influenced all of my bad choices. But could I give it up? What would I be without my pain and fear? It’s as if I believed pain was the psychic glue holding me together. Did I have some reason to cling to pain — maybe I was not worthy of feeling happy? I love this – i love you…I love knowing you better.